Are you comfortable with your current benchmarking methods and the salary ranges at your company? How to Perform Compensation Benchmarking and Set Salary Ranges provides you a step-by-step guide to benchmarking and setting salary ranges that allow your company’s compensation strategy to be transparent and competitive. Recently featured in Re:Locate Magazine, MOVE Guides is shaking up the world of global mobility and relocation with their Talent Mobility Cloud, the system equipping talent mobility professionals with the resources they need to become a strategic business partner for the 21st-century organization. A nationwide survey finds that a 401(k) is viewed as an essential workplace benefit and that people take saving for retirement very seriously in much the same way they strive to manage their health. In fact, 90 percent of respondents said they would think twice about taking a job if the company did not offer a 401(k) plan. Chaplain Care for Employees- What it is, what it isn’t! Savvy business leaders are addressing the changing needs of laborers in the workforce year-round with the use of Marketplace Chaplains, helping employees deal with life’s stressors, whether they work on the factory floor or in the corner office.. This white paper explains the challenge of disengagement from the ground up, helping you understand the most pressing workforce challenge today. Better yet, we have strategies to help you use disengagement to highlight the importance of L&D and turn it into one of the most important functions of your organization. At InfoMart, we know that you need certain information to successfully fill particular positions, and we can tailor a background screening program to meet your specific needs. Our experts will help you develop a background screening program customized to you workforce’s potential role(s) at your company. A good investigation interview is only as good as the person conducting it. As with all skills, practice makes perfect, but there’s no harm getting a bit of help along the way. Follow these 40 tips to get the most out of your interview subject. Working parents are burned out, feeling less creative, less energized about their jobs…and likely to quit. Our study, the second annual Modern Family Index, talked to working parents and managers about challenges these employees have in managing their work and family responsibilities, and how they’re feeling. Choosing payroll and HR software can be an intimidating task, especially with all the options available in today’s market. These questions should get you thinking about what to look for when deciding which software is best for your organization’s specific business needs. Ready to ditch the tired paper timesheets or cumbersome Excel spreadsheets and make the jump to online time tracking for your business, but aren’t quite sure your employees will be on board? Below are six great benefits you can share with your team to help make the transition easier. What’s in your health care toolbox? WalletDoc increases employee participation and savings! The adoption rate of high-deductible health plans (HDHP) continues at a quick pace, showing a 5% year-over-year growth to 31% compared to 26% in 2014. But without the proper education on medical costs, many people opt out of seeking medical assistance, resulting in increased sick days and lower productivity for employers. What Does It Mean To Be A Trusted Advisor? There are various reasons you may want to consult with a trusted advisor, but you aren’t sure where to start. Let’s review some qualities of a true trusted advisor, particularly health insurance or payroll advisors. If your workers loathe the very threat of training, it’s not because they’re uninterested in learning; it’s because you’re doing it wrong. Luckily, it’s easy to design a program that works better. While the number of businesses and individuals using emergency notification systems are increasing, there are, unfortunately, cases in which messages have been inaccurate and caused confusion during a crisis situation. Effective communication should be the key to communicating in a crisis situation. Did you know that 25% of employees dread performance reviews more than anything else in their work lives? Make sure your team doesn’t fall into that category! 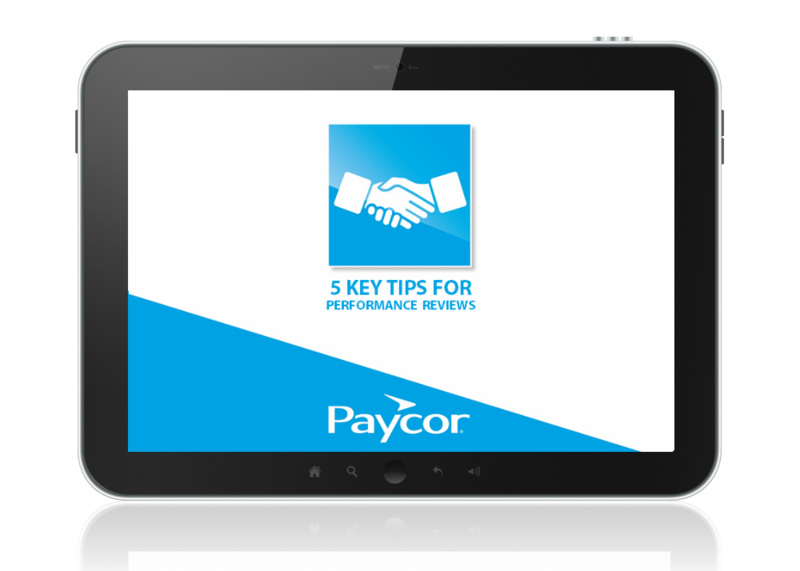 Paycor HR Business Partners Becky Falvey and Lauren Ammon offer actionable tips for managing performance reviews. Watching this webinar will help you make your review process a true opportunity to develop your employees. As the HR leader, you need to lead your company through the compensation planning process. Do you know how? 5 Easy Steps to a Smart Compensation Plan is a succinct, step-by-step guide to help you with compensation planning and salary benchmarking. Are your competitors growing and giving raises in 2013? Find out. PayScale questioned over 4,000 executives and HR professionals about what they experienced in 2012 and their top concerns and plans for 2013. Want to know what they said? Download the 2013 Compensation Best Practices Report.